“Celebration” does not seem to be the right word for marking the centennial of the Great War. “Observance” is better, less celebratory. Maybe solemn should be added to convey the somberness the great tragedy deserves. At any rate, the academic book binge that generally accompanies chronological mileposts has begun in earnest. 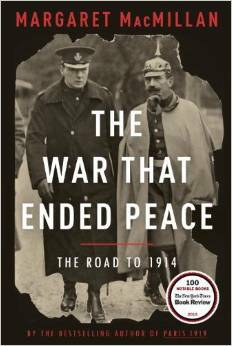 Among the first is Margaret MacMillan’s The War that Ended Peace: The Road to 1914, a hefty tome, but not a heavy read. My first close encounters with World War One were annual New Year’s Day visits with Great Uncle Tice, who spent the war bivouacked at Fort Dix, New Jersey. Academically, my first encounters came in the form of Sydney B. Fay’s two volume Origins of the World War (1928, 1930) and Barbara Tuchman’s The Guns of August (1962) and The Proud Tower (1966). Fay was big on memos, telegrams, and treaties, but short on personalities. Tuchman reversed the ratio, giving us the tutu-clad German general keeling over from a heart attack. Margaret MacMillan’s latest book balances the equation; she gives us both the glitzy general and the memos, a book this is part epitaph, part lighthouse, and part bookend. As for the bookend role, I decided to read The War that Ended Peace because I thoroughly enjoyed MacMillan’s account of the Versailles Conference, Paris 1919: Six Months that Changed the World. Having explored the war’s aftermath, there is symmetry in her analyzing the origins. Some of the players appear in both books: David Lloyd George, Georges Clemenceau, and Woodrow Wilson to name some obvious ones. Maybe more important are the disconnections between the two casts, a sure sign of the carnage the war wrought both on the foot soldiers and the leaders. I will say up front that this new work is the equal of the previous one. As for the epitaph role, the book presents an account of a remarkable pre-war world, an era swathed in well-founded optimism that ended in cataclysm. “It did not have to end this way” (spoken alternately in sadness, remorse, regret, and anger) forms the book’s leitmotif. Where Fay attributed the war to historical forces, MacMillan places the blame squarely on people. She writes in her introduction: “Forces, ideas, prejudices, institutions, conflicts, all are surely important. Yet that still leaves the individuals, not in the end that many of them, who had to say, yes, go ahead and unleash war, or no, stop.” In 1914 those people failed to say “no”, and millions died because of that failure. Because people did it, MacMillan devotes many pages to portraiture. Personal foibles count: the Kaiser’s physical and psychological malformations, the Czar’s sense of inadequacy, the Emperor’s hope to simply die in peace, his headstrong heir’s determination to legitimatize himself and his marriage. During that fateful month between the Archduke’s assassination and the outbreak of war the German Chancellor, Theobald von Bethmann-Hollweg, functioned in a thick haze of bereavement. He told an aide, “What was past and should have been future,… all that was tied to our common life is now destroyed by death” (Chapter 18). If not for his understandable melancholy, how might he have advised the Kaiser, and changed the course of events? The Chancellor’s foreboding fits with the paradoxes, melancholy, and pathos that pervades the book. 10,000,000 deaths will do that a work on war. Even the book’s epigraph sets this tone, with quotes from Camus – “There have been as many plagues as wars in history; yet always wars and plagues take people equally by surprise” – and Elizabeth Bowen – “War is not an accident: it is an outcome. One cannot look back too far to ask, of what?” Over against the blundering, blustering, warmongering officers and politicians MacMillan offers two individuals who pointed to the road not take: Bertha von Suttner and Jean Jaures. An Austrian and a Frenchmen, an activist and a politician, the wife of a noble and a dedicated socialist – this odd couple of the peace movement, each in their individual ways, fought the good fight against war. Both were spared from seeing what their unheeded warnings failed to prevent. A French nationalist assassin struck down Jaures as the armies mobilized throughout Europe in July 1914, while von Suttner died in Vienna one week to the day before the Archduke fell in Sarajevo. As for the lighthouse, MacMillan clearly wrote this book with our own time in view. That shadow world of disgruntled zealots fomenting plots, assassinations, bombings, and self-affirming conspiracy theories remains with us, transported from the Balkans to Kanduhar and Yemen. MacMillan sees dots to connect between Wilhelm II and George W. Bush, both of them feeling compelled to outdo their elders’ martial victories. In 1914 ill-conceived decisions led to 10,000,000 deaths. To what fate might a similar string of fateful choices produce in our own time? What remains of a World War I trench from the Battle of the Somme. The monuments that dot northern France mark the road taken in 1914 by the Kaiser, Czar, Emperor and their contemporaries. The Peace Palace in The Hague marks the one not taken, despite people such as Jaures and von Suttner. War is an awful thing, and few have been more awful than World War One. It draws us in like the abject ghastliness of a horror movie or a gory accident. What Macmillan details in 700+ pages is a simple truth—World War One did not have to happen. Call them malicious, ambitious, stupid, or ignorant, the players on that stage connived and calculated in a muddled manner. They made choices that doomed millions, maimed more, and mentally scarred still more, drowning the Mighty Continent in a maelstrom of its own blood. But, and this is the key in Macmillan’s account, it did not need to happen. This entry was posted in Bob Schoone-Jongen and tagged book note, book review, history, Margaret MacMillan, World War I. Bookmark the permalink.